Nature'S Air Sponge Odor Absorber Unscented Plastic Tub 1 Lb. (24) ea Delta Mktg. 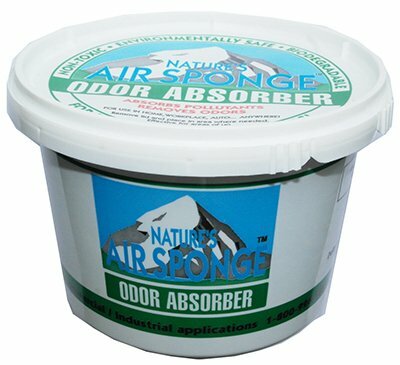 # 101-2 Nature's Air Sponge 1 Lb Odor Absorbers 1 LB, Odor Absorber, Nature's Air Sponge, In Container, Eliminates Virtually All Odors & Pollutants From The Ambient Air In Your Home, Office Or Car As Well As Any Lingering Effects In Clothing, Drapes Carpets & Upholstery, Great For Musky Basements, Pet, Gasoline, Tobacco Smoke Odors As Well As Mildew, Fresh Paint, Solvent & Diaper Odors, Use For Sewer Gas Treatment Facilities, Municipal Bus & Subway Systems, Commercial Airlines, Hotels, Hospitals & Restoration Of Buildings Damaged By Fire & Other Disasters.